At any time there are dozens of forms products on the market so how do you choose the right option for physically creating your form? In this paper for the Business Forms Management Association Symposium, I explore five areas you need to consider. Features: What does the software do? Can it do the things you need it to do? Fit: How will the software fit in with other products that you use, and with your organisation’s IT strategy? Futures: Where is the market going? Is this product going to leave you in a proprietary niche or without support? Flexibility: What changes can you foresee for your organisation? Do you need to plan for different needs or working practices? Funds: What’s your budget? Can you afford the product, the licenses, the training, the upgrades? − send the amended image to my client, for comment and discussion. I was pretty excited when the launch materials for Adobe Photoshop CS came out. Ten new features! Sounds great! Fortunately, the hefty price tag stopped me from buying it immediately. I checked the new features instead – and found that I did not need any of them. Worse, I did not even understand some of them. − now you have a list of features that you currently use. When you are investing in new software, you can plan to do some things in a new way, and some new things. But it helps a lot to know that you are getting the features that you really use frequently. You know what? I don’t know a single product that does all of those things. But it is possible that you don’t need all or them – or even any of them. So that is where your own list of features is so valuable. In 1992, the Communications Research Institute of Australia brought out a wonderful piece of software called “Forms Designer”. It was built entirely around principles of usable forms design, and its manual (if you can find one) is packed with good advice. But to run it, you needed a high-end Mac, and those were rare and expensive. Forms Designer never got the success it deserved. So irrespective of the features that a product offers, you need to think about how well it fits in with the equipment that you already have and with your organisation’s IT strategy. Some points to discuss with the IT department (or to think about yourself, if like me you are the IT department). − How much storage will you need, and where will it be located? Good quality graphics still demand lots of storage and a high-speed network to get them to it. − What specification of computer is needed to run this software speedily? A touch too little RAM and a slightly slower processor and you may find that your new software becomes horribly slow or even starts to crash a lot. − When do you next plan to upgrade? and will you be staying with your current platform and operating system, or making a change? − Will you need any specialist input devices such as a tablet or digitiser? Will your IT department agree to support them? − Will you need separate, slower speed computer(s) to test electronic forms on multiple browsers, platforms or operating systems? − Forms design software often needs a really great screen to work well: high resolution, big (so that you can see those tiny dots) and sharp. Will your current monitor be good enough or will you need to upgrade? If it seems difficult to gaze into the crystal ball of what your organisation plans to do with its IT, then the next F will be even worse. This is ‘futures’, where we try to pick products that are going to survive in the cut-throat world of the marketplace. Where is the market going? Do you remember WordPerfect or WordStar? I knew WordStar so well that my fingers had all the control codes learned into the muscle memory. 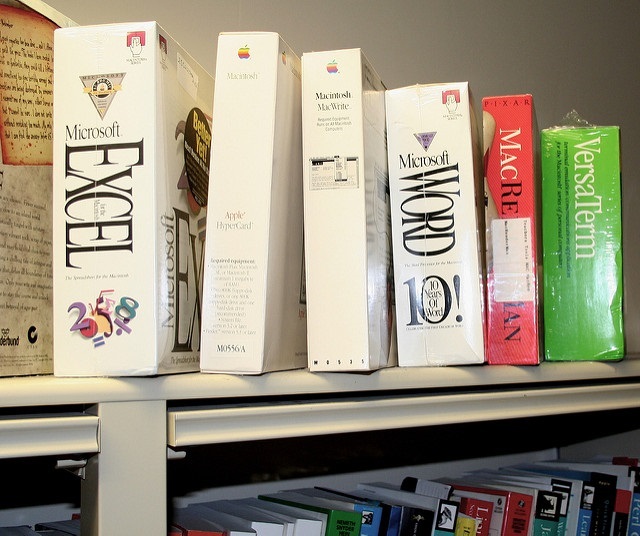 Then along came Microsoft Word, and those two competitors were history. It didn’t matter that Word in its early days was nowhere as good as WordPerfect (and some might argue about whether it has ever caught up). WordPerfect and WordStar lost, Word won, and we all had to get used to it. If you are planning to spend $29.95 on a piece of shareware, don’t sweat it. Your time in learning that software is going to cost more than you’re spending, so you may as well try it and throw it away if you don’t like it. This ‘futures’ problem really matters if you are investing five- or six- figure sums. Those are decisions that require lots of approval and create embarrassment if you get it wrong. − Make sure that you can export to a good selection of ‘vanilla’ formats such as CSV (comma separated values), plain ASCII text, rich text files, Acrobat .pdf, and/or .png (portable network graphics). − Equally, make sure that the product offers you a good range of import options. This shows you that its developers look outside their own business and realise that they have to work with other products. − Who are your customers? − How much have you sold? − What are your longer-term plans for this product? − How do you see your business in five years? − How do you see your major customers changing in five years? Finally, try to find out who loves and who owns their product and think about the implications. If investors love it: are they in for the long-term or looking for a quick buck? If it has recently been acquired: are the new owners buying to invest, or to kill of the competition? If it is still owned privately: is the owner planning to invest, or to sell to get bigger backing, or to sell and grow roses? We have limited ourselves to the features we need today, we’ve checked that we have the right technology so that it fits, and we’ve satisfied ourselves that this product has a future. What could possibly go wrong? Change, that’s what. How many of us are doing the same job today that we did five years ago? − Five years ago I got my first Internet email account – now I run three websites and fight spam all day. − My best customer has done two major acquisitions, reorganising each time. organisation) and now they are up for sale after a boardroom-level financial scandal. Even if you’re still working for the same organisation, chances are that you’ve seen some changes in working practices: the type of forms that you develop, or a change from purely paper to a mixture of paper and e-forms. − The licensing cost, or the purchase price. Is it per site, per seat, or an all-in price? − If you are developing electronic forms, do you have to buy a filler and if so for how much? − Do they have a cheaper or free ‘reader’ software available (e.g. like Acrobat Reader)? − What about importing your back catalogue of forms? If you plan to do it internally, who will do that work and do they have time? If you plan to outsource it, how much will it cost? − Is training included, or will you need to pay extra for it? How many people will you need to train and how long before they are up to speed? − Will you have to pay royalties on the forms that you use? (This one applies mainly to some of the on-line forms-on-demand tools). There is no ‘one size fits all’ in software for developing forms. I do a lot of forms design using paper, scissors and a glue stick. They are cheap, effective, and it’s really quick to get through lots of iterations of design and testing – but they lack a certain something when it comes to producing high-quality output. Then there are the ordinary office tools such as Word. Easy to find, easy to exchange designs with colleagues, and a complete pain when it comes to trying to make the form look like a form rather than a clumsily-designed Word document. At the top end of the scale, there are some wonderful software options that will help you to deliver and manage great forms. You will have had the opportunity to talk with some of the vendors at Symposium, and they will work hard to win your business. None of these is the ideal solution for everyone, but if you remember the five Fs: features, fit, futures, flexibility and funds, then you’re likely to end up with a tool that works well for you.